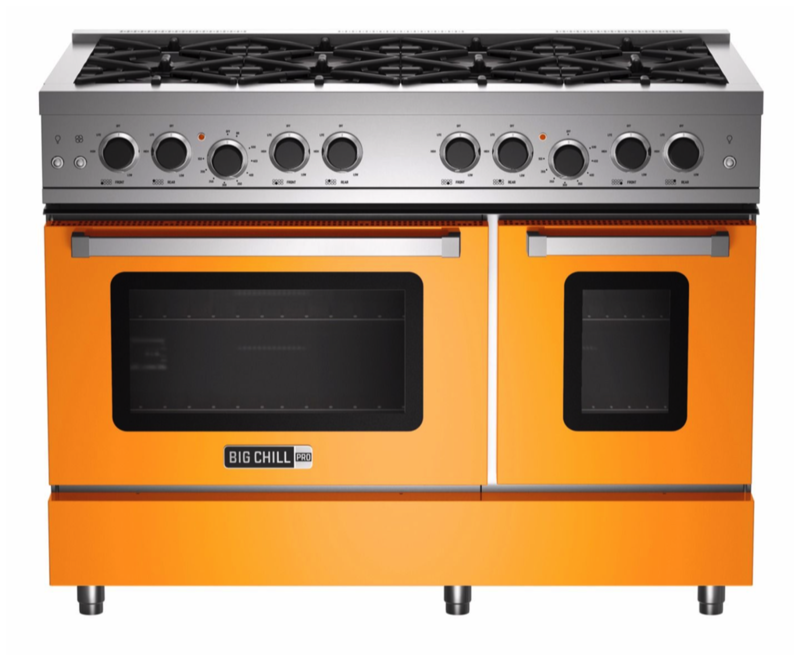 The kitchen is the household's central gathering place and is a key place for using color creatively in the home. 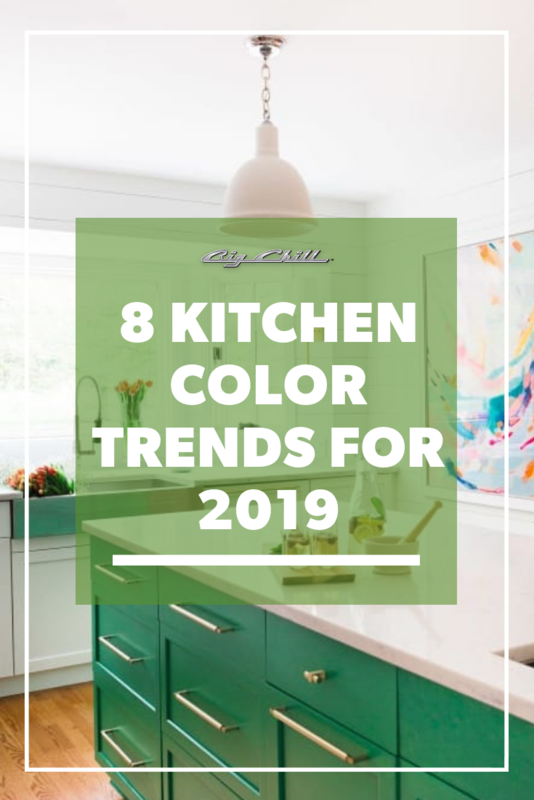 In 2019, kitchen's are taking on more and more vibrant color, mixing and matching shades to create high energy and atmosphere. 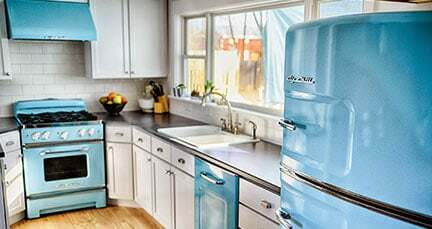 Ever dreamed of having a coral refrigerator? Owning a daiquiri green stove? The kitchen colors you choose should always reflect your personality and tastes, whether it be an intricate tile backsplash or a few simple accessories. Color trends in 2019 are focused on earth-friendly tones, from grass greens to mushroom browns. Reflecting a more eco-conscience planet, current color trends show that households are inspired to get in touch with Mother Earth. 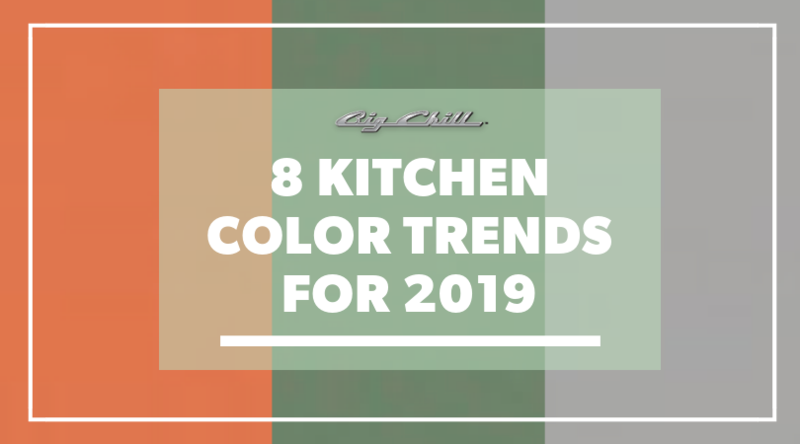 From appliance colors to wall colors to cabinet colors, these 8 colors are at the top of the color trends for kitchen decor in 2019. 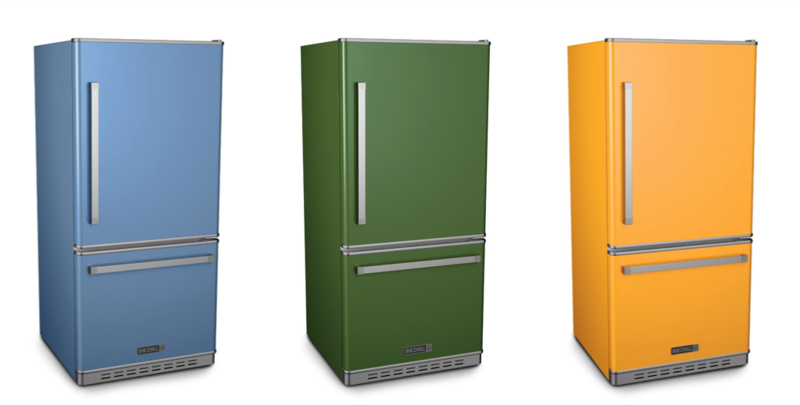 Looking for the perfect color for your kitchen appliances? 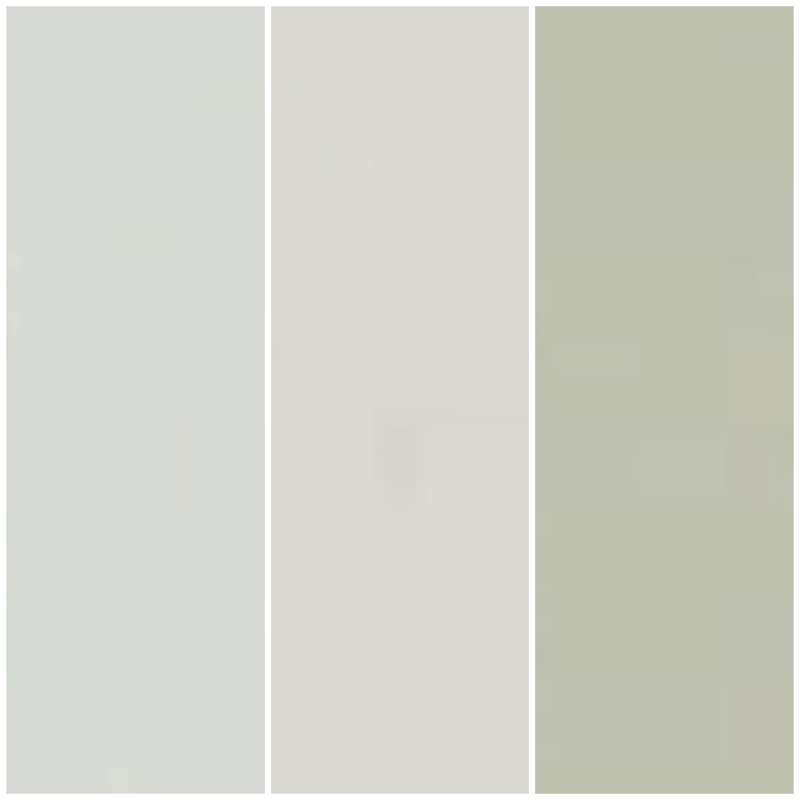 Check out our custom color swatch with over 200 custom colors and shades. 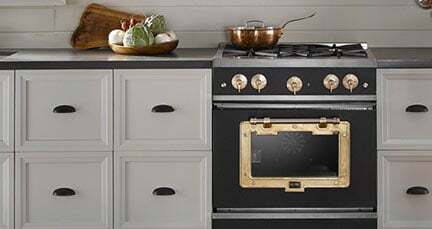 Warm and welcoming, golden yellow is hot in kitchen design and brightening kitchens around the globe. 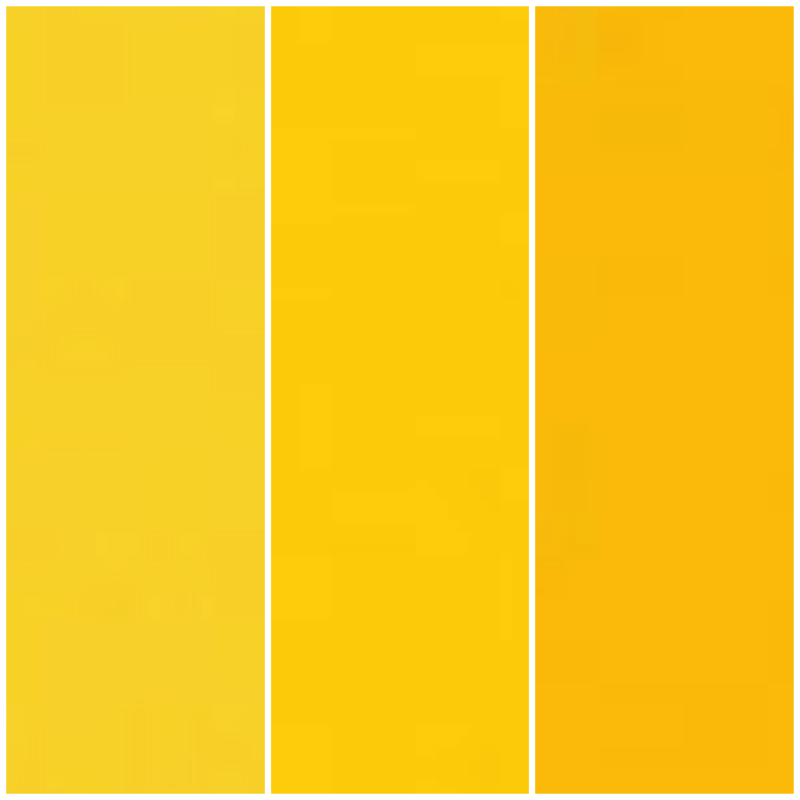 From sunflower to marigold to saffron, golden yellow is an orange-tinged yellow that warms you up from the inside out. A representation of the element gold, golden yellow is not too dull or too bright. In 2019, people are more commonly looking for warm colors that are comforting and comfortable, no matter the season or time of year. 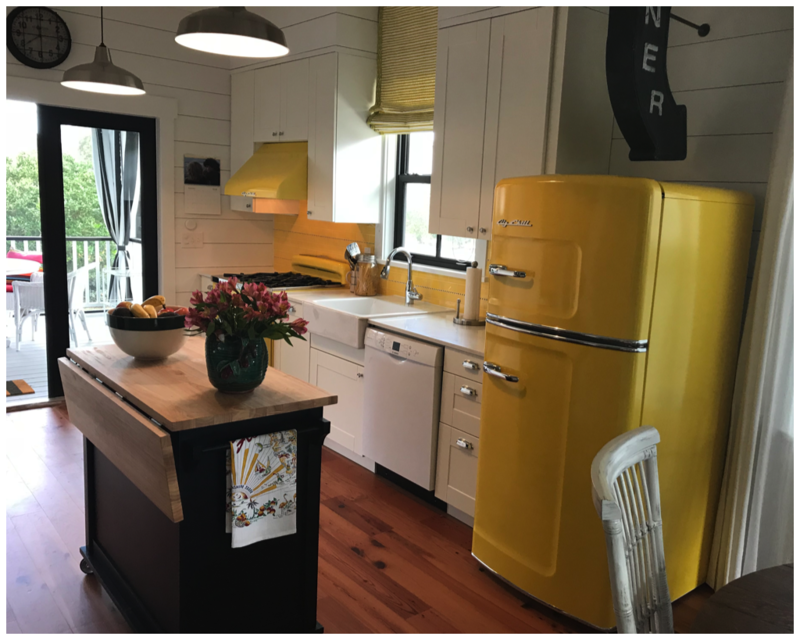 An appetite stimulator, golden yellow will warmly welcome everyone into your kitchen and wrap them in a ray of rich color. 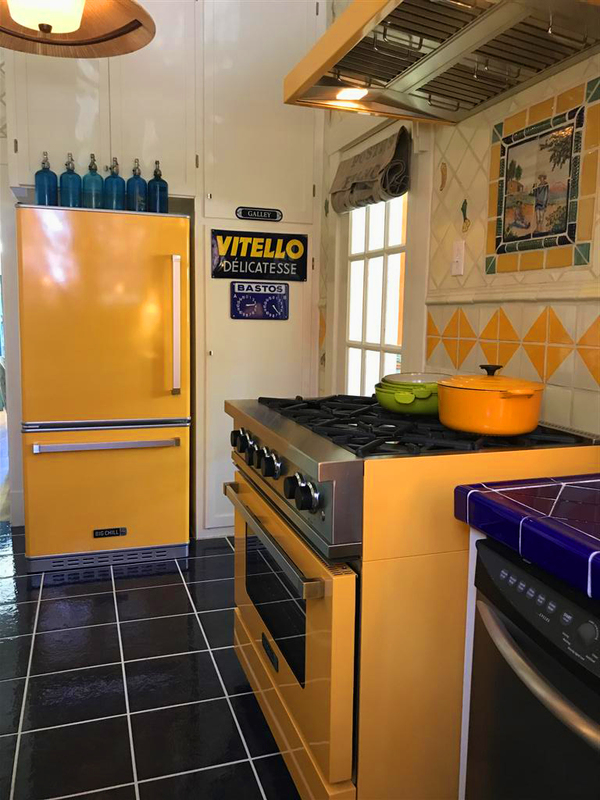 Big Chill Retro 30" Stove, Hood, and Original Refrigerator in a custom yellow color. 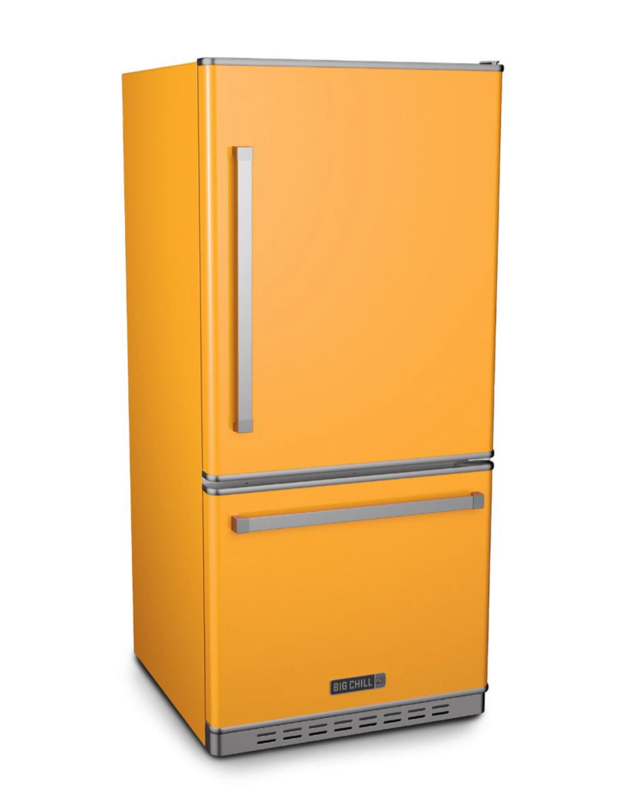 Big Chill Pro Fridge, 36" Pro Stove, and 48" Pro Stove in Sunflower Yellow, one of the nine standard colors in our Pro Collection. 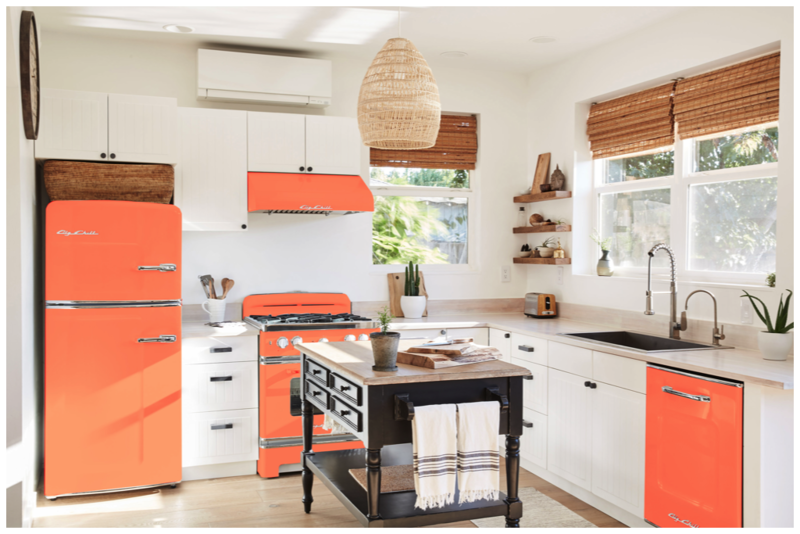 Coral is hot at the top of the list for color trends in 2019, taking over our social media feeds and popping up in places where we least expect it. 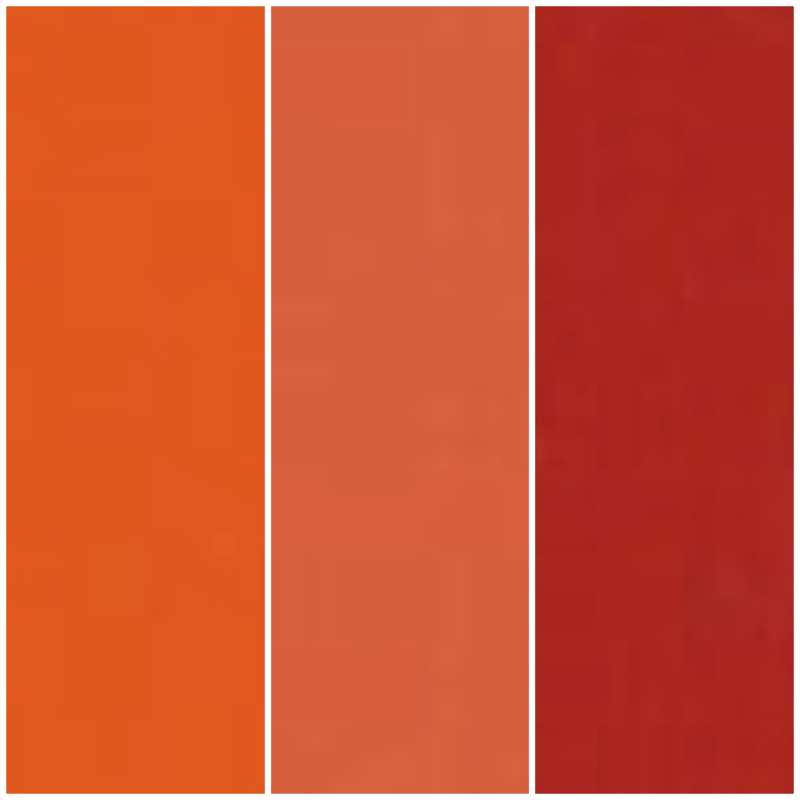 The color coral is named after the sea animal, also called coral, and is a reddish or pinkish shade of orange. Vibrant and cheerful, the color coral is alive in its own way, taking us back to the colors of the natural world. 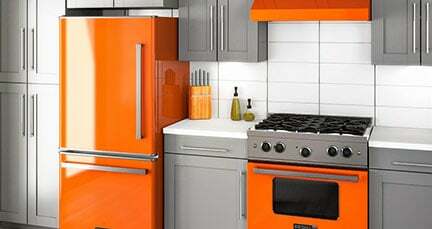 Color can brighten our mood, and using coral in your kitchen will be sure to bring joy to anybody who enters it. Subdued and slightly muted, French Blue is an elegant shade of blue that provides a pop of color without overwhelming the senses. This silver-toned blue has been popular in the latest home design trends, providing a unique color palette that can either be left on its own or mixed with other colors for a flattering contrast. 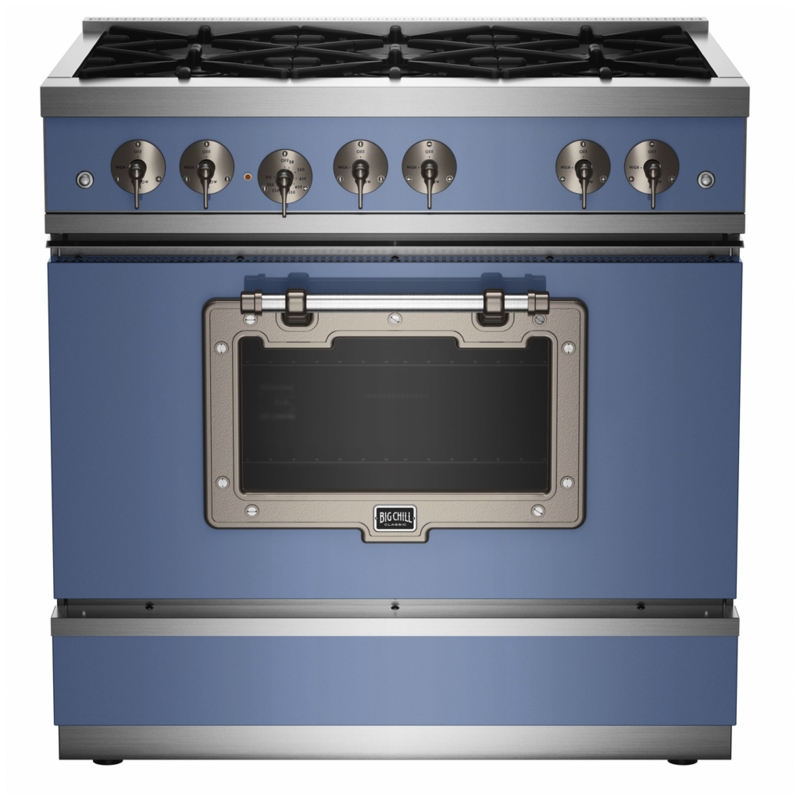 French Blue also compliments a range of metals and finishes, from gold to silver to nickel. 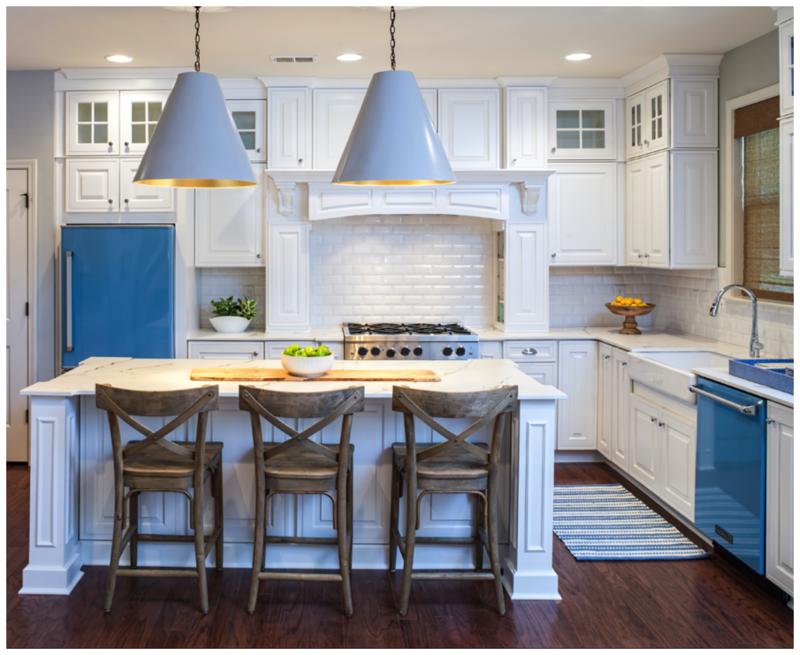 Pair French Blue with white in your kitchen for a classic contrast, or pair with colors like golden yellow or chocolate brown for an unexpected duo. 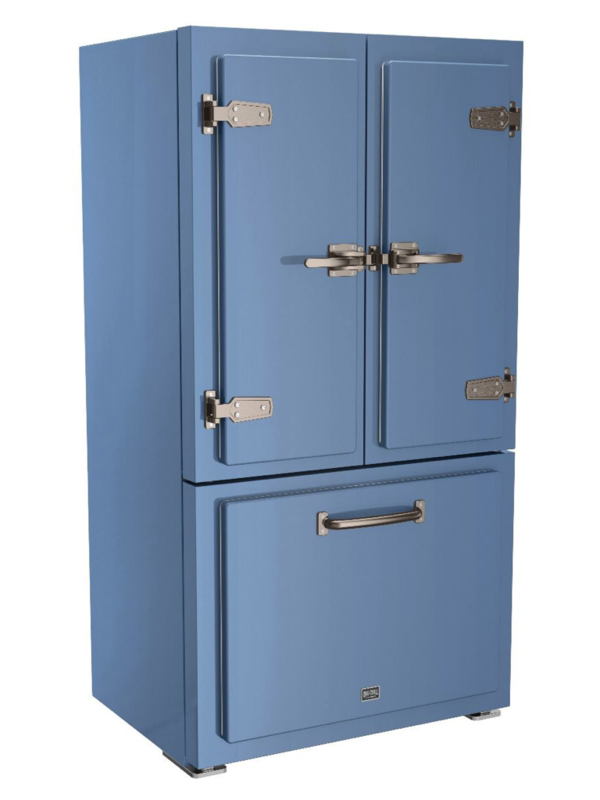 Big Chill Classic Fridge and Classic 36" Stove in French Blue, one of the six standard colors in our Classic Collection. 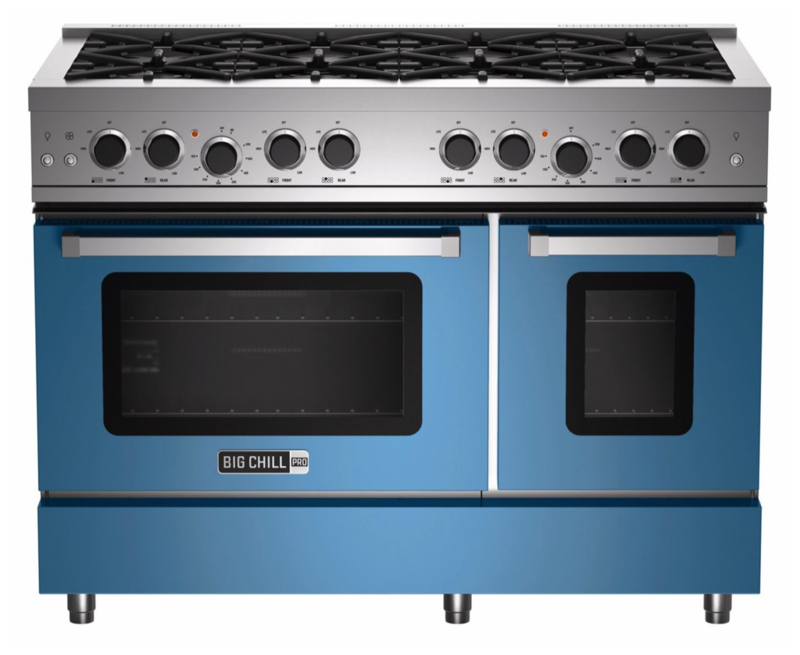 Big Chill Pro Refridgerator, Pro Dishwasher and Pro 48" Range in French Blue, one of the nine standard colors in our Pro Collection. A vibrant color that refreshes the senses, daiquiri green is a bright color reminiscent of a tropical vacation or an ice-cold drink. Like taking a trip to Cuba or the Florida Keys, daiquiri green transports you out of your kitchen and into a lush oasis. 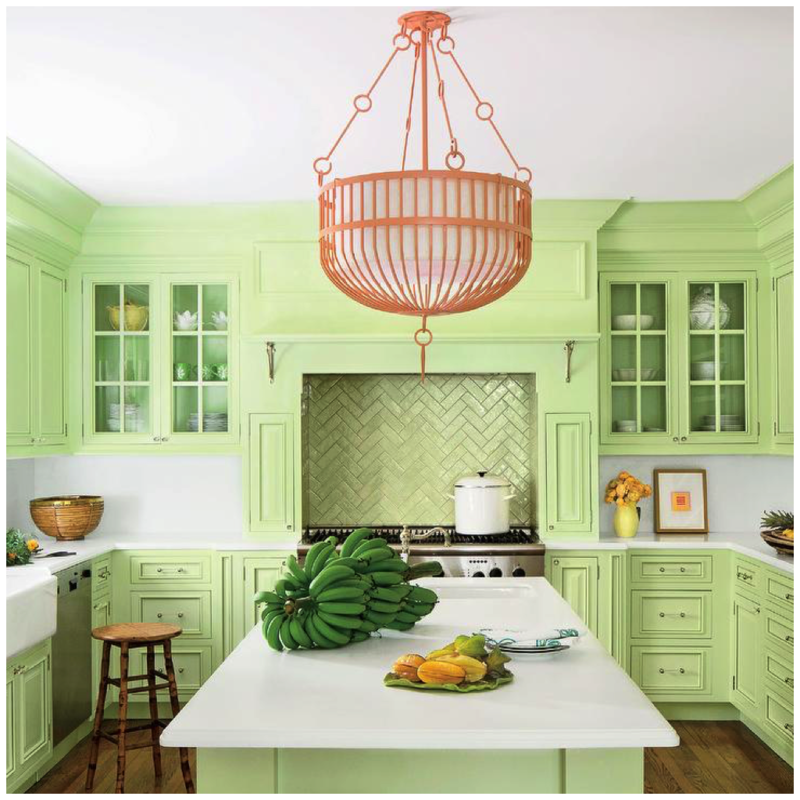 Pair daiquiri green with coral for a classic tropical combination, or pair with raw wood and white cabinets for a look that is shabby-chic yet modern. Is Daiquiri Green the color for you? 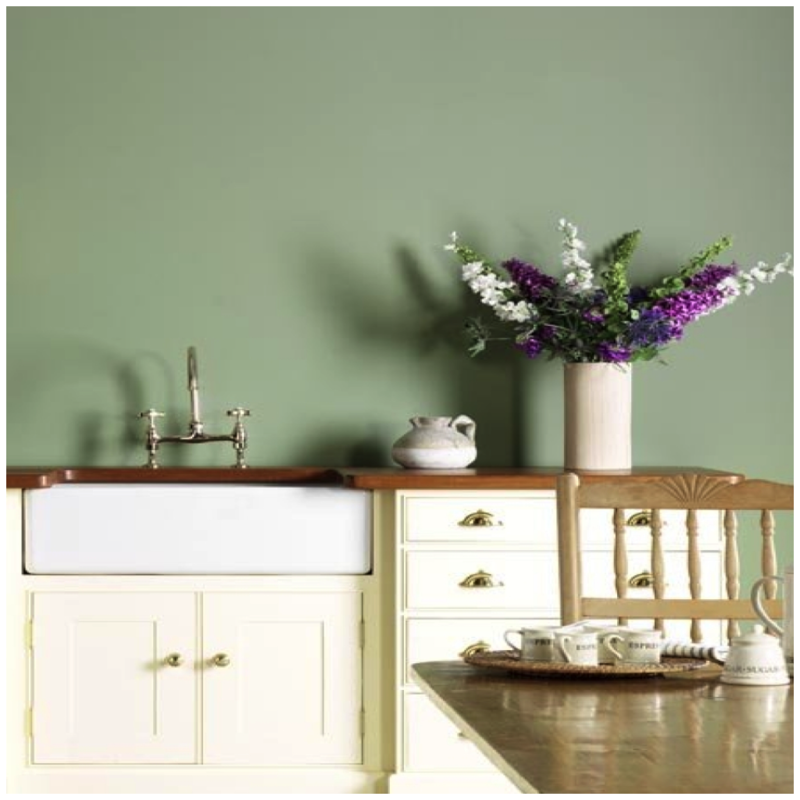 Check out Big Chill's version, Jadeite Green, one of the 9 standard colors in our Retro Collection. 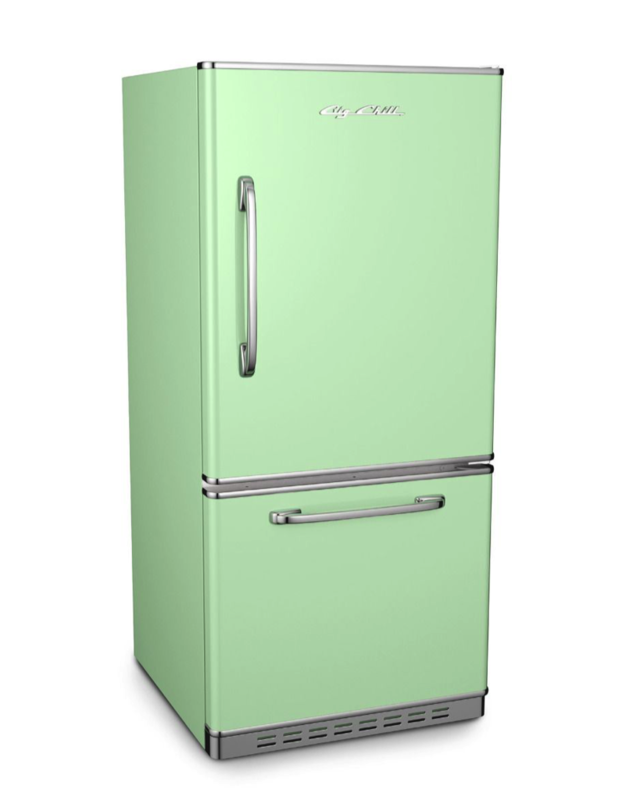 Check out our version of Daiquiri Green: Big Chill Retropolitan Fridge in Jadeite Green, one of our nine standard colors in our Retro collection. 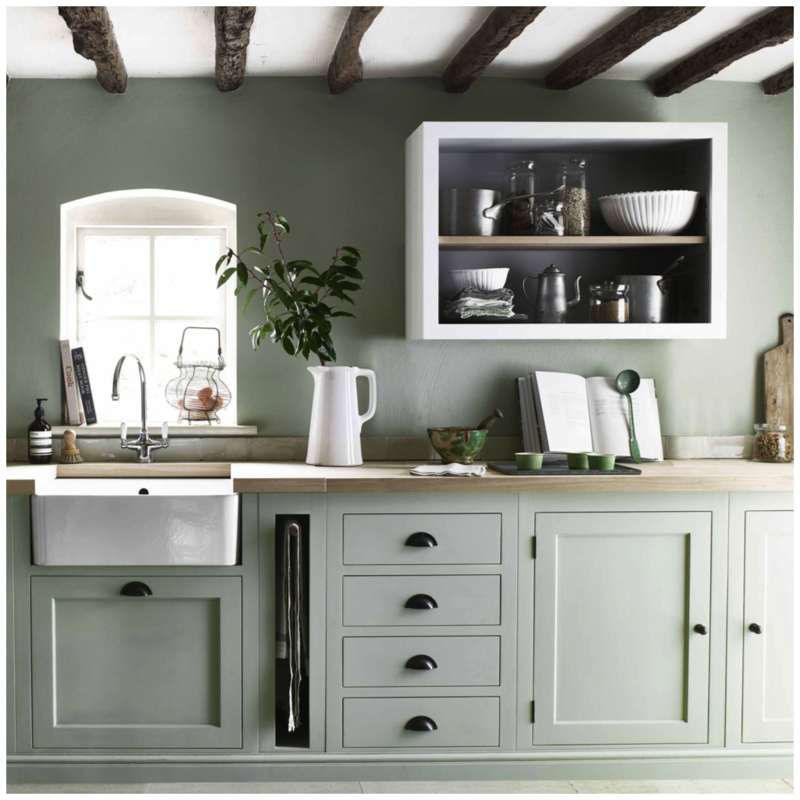 Embrace calm and tranquility in 2019 with sage green in your kitchen. Resembling dried sage leaves, sage green is a soft, silvery green that is pulled directly from a garden. A neutral-green, sage hues have taken over home design trends in the last year. 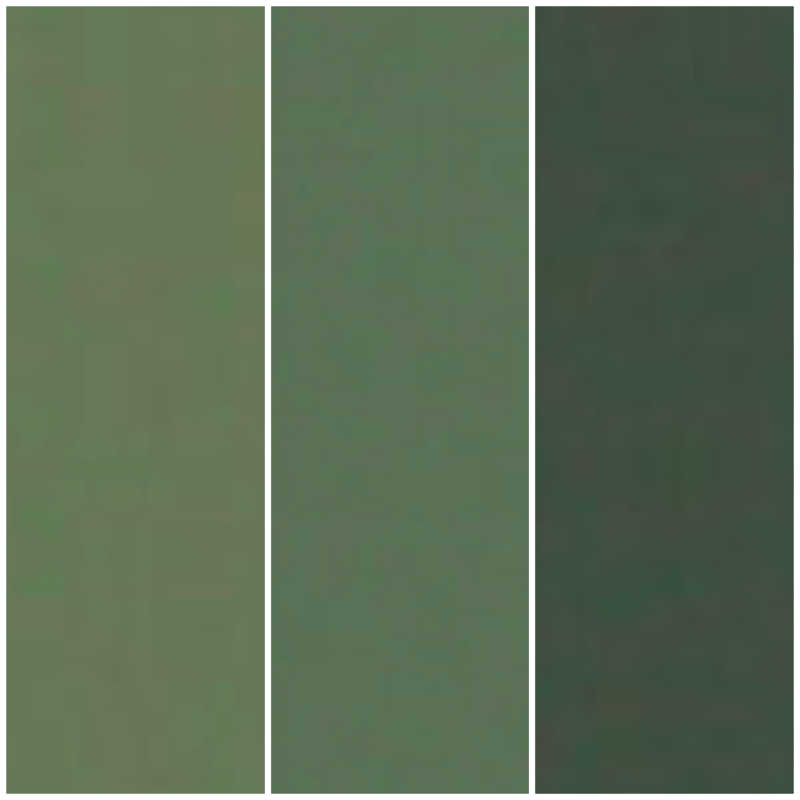 Sage green is easy to work with, providing a neutral base that compliments a variety of colors, tones, and textures. 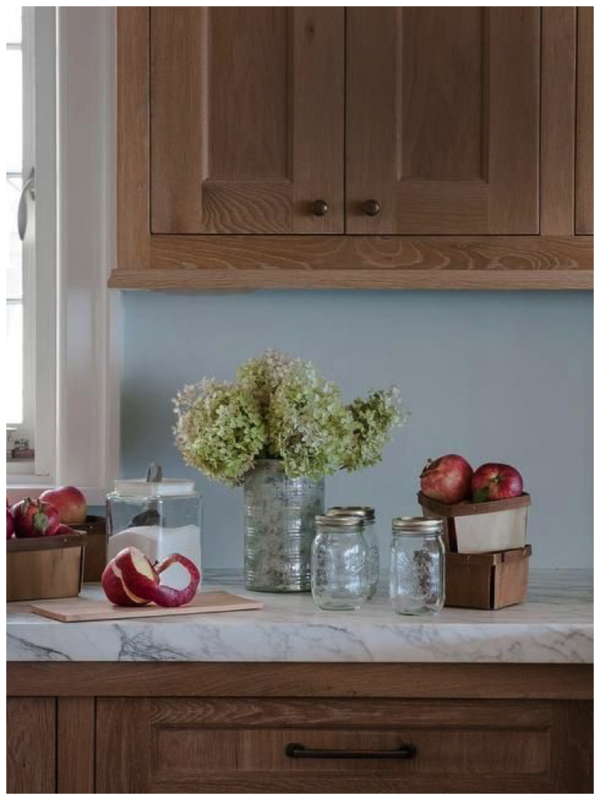 This relaxing color soothes the senses, providing a sense of calm and relaxation that will translate daily to your kitchen guests and frequent visitors. Pair sage green with raw wood for a timeless look that is earthy and rustic. Bright and invigorating, grass green is a vibrant color that awakens any space you use it in. 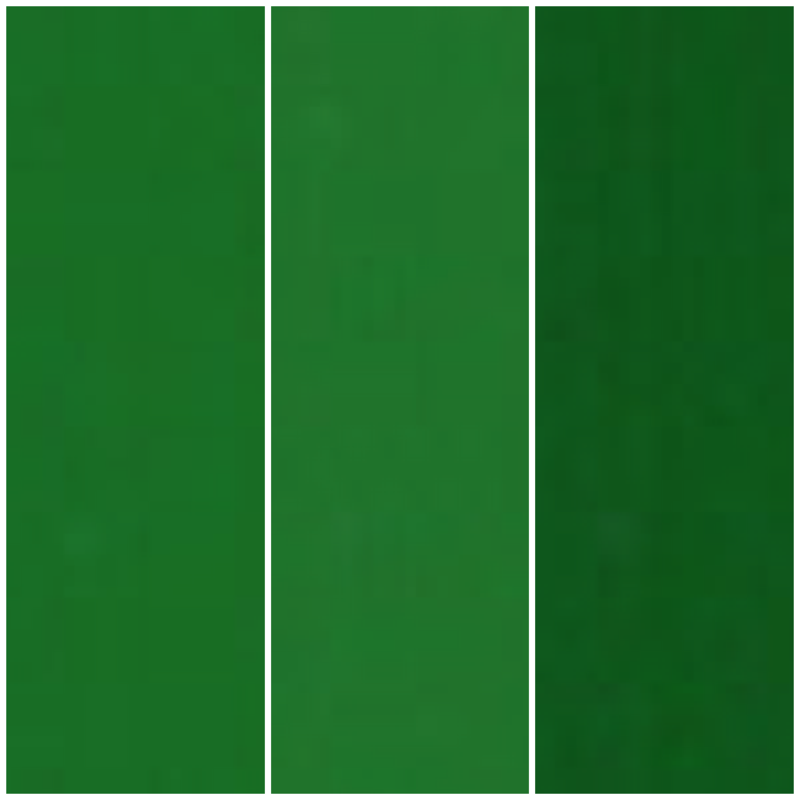 In 2019, colors that bring us closer to nature are more popular than ever, and grass green fits the bill perfectly. Grass green has enough personality to give your kitchen the perfect splash of color it needs, whether you choose to use it on accessories, appliances, or even a center-island counter. 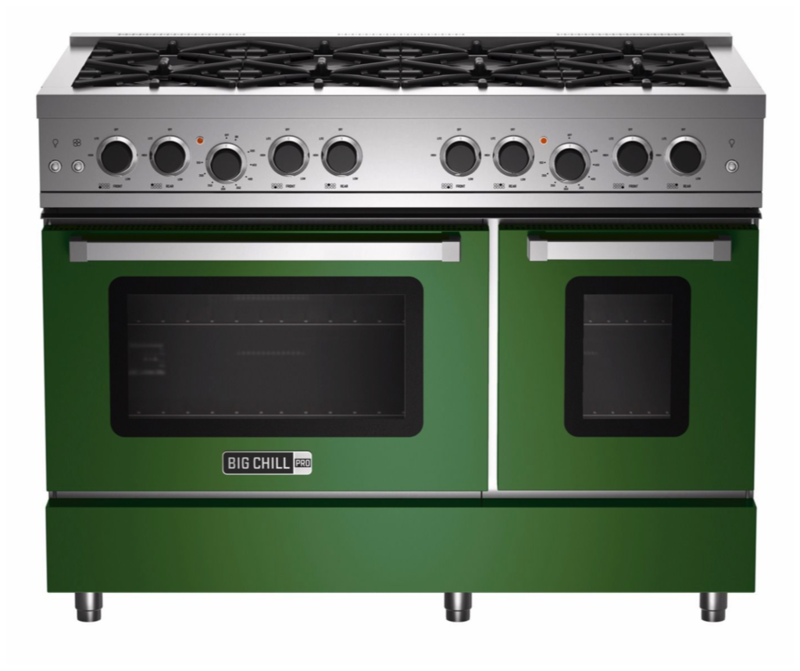 = Big Chill Pro 48" Range in Basil Green, one of the nine standard colors in our Pro Collection. 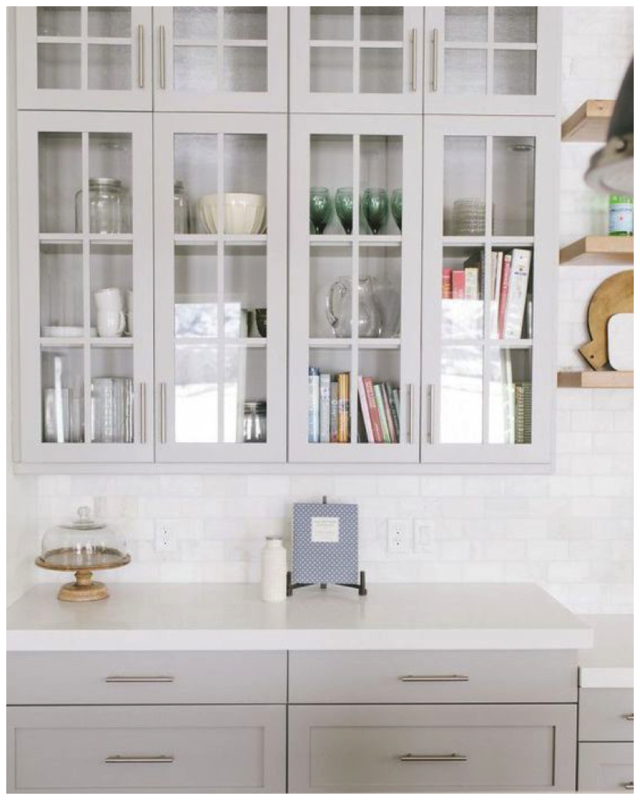 Pastel grays are all the rage in home design for 2019, providing a soft base of neutral color that is reminiscent of a foggy morning or rainy afternoon. 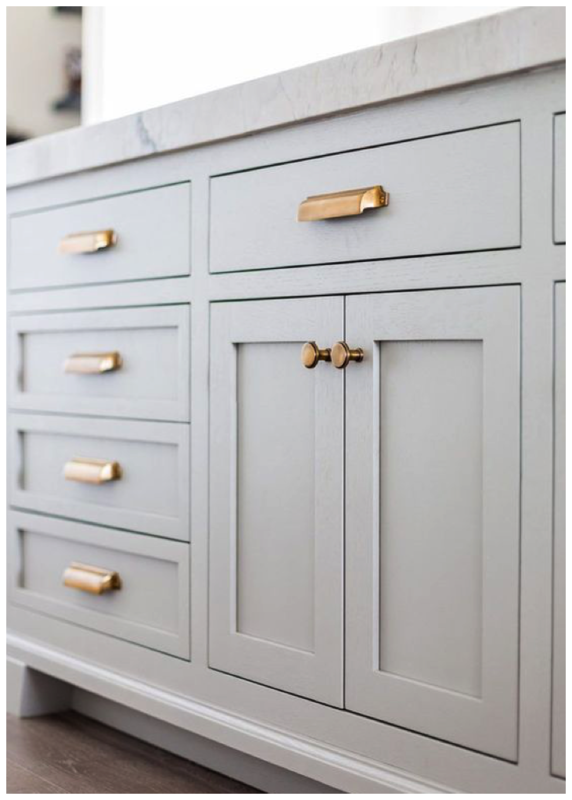 Pair soft gray shades with natural surfaces like marble or wood for a timelessly chic aesthetic, or pair with gold hardware for a contrast of warm and cool tones. Inspired by nature, mushroom brown is about as earthy as it gets when it comes to home decor. 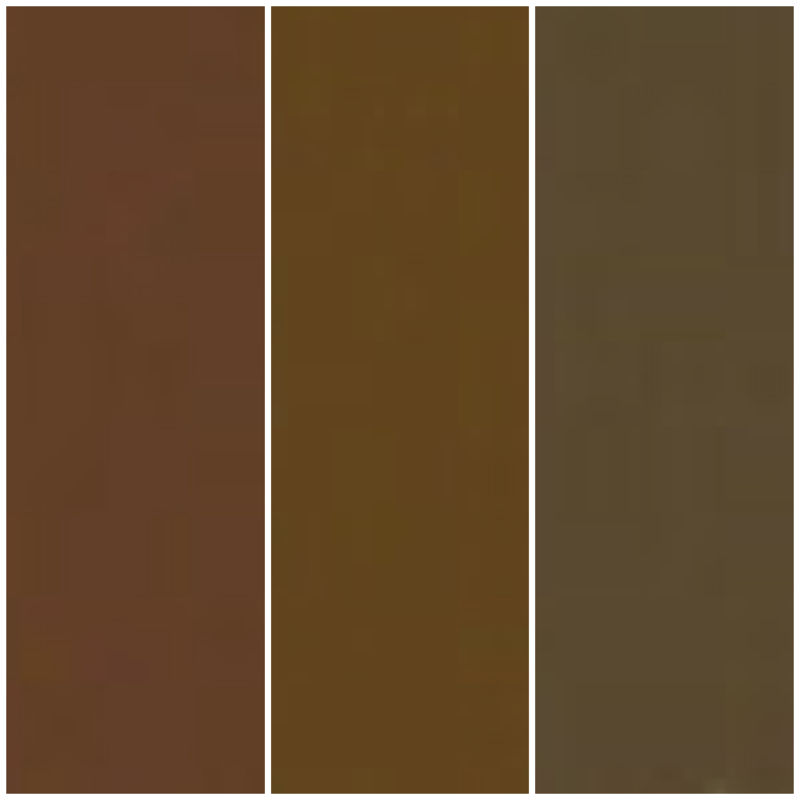 Ranging from warm to cool-toned, mushroom brown is a color pulled directly from the earth. 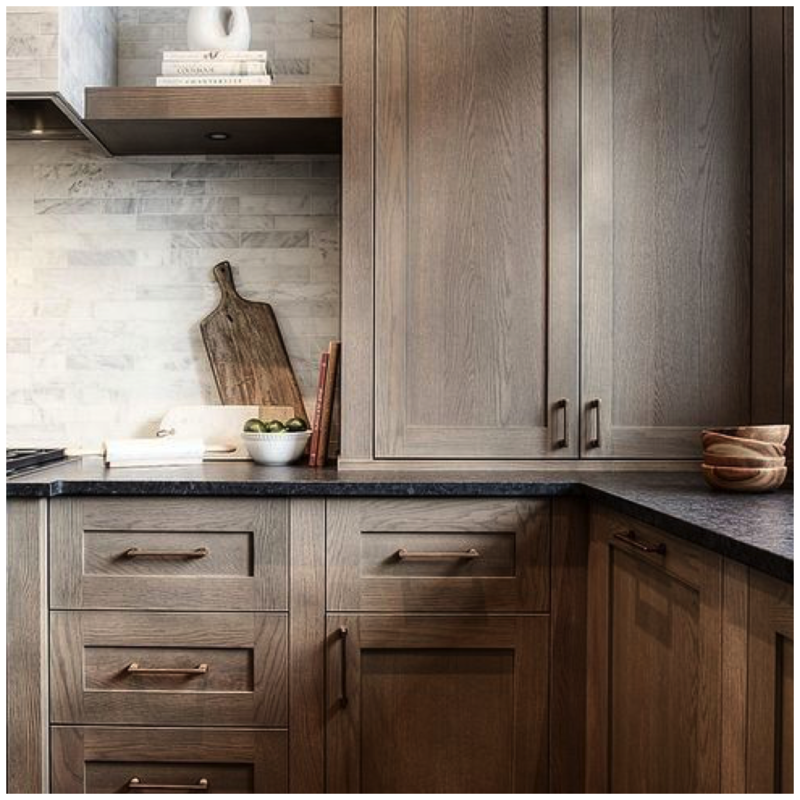 Use mushroom brown in your kitchen with a variety of complementary natural textures, like stone, marble, and raw wood. Pair mushroom brown with a light gray or a subtle blue for a pairing that is timeless and chic. Like this post? Re-pin the image below to share with family & friends.